Questions to Ask a Utah County Realtor? Realtor Interview Question #1: How Long Have You Been Selling Homes? Do you want a new agent without the financial ability or marketing strategy to sell your home? Ask how long the Utah County Real Estate agent has been licensed and how many buyers and sellers he or she has helped. While time is not the most important factor, it may demonstrate experience. 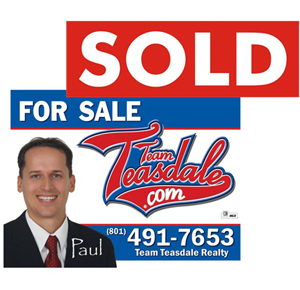 Paul Teasdale has been selling homes full time since 1995 and has sold over 1,100 homes in Utah County. We have 1,500 Realtors in Utah County. We estimate that less than 1% of the Realtors in Utah County have sold over 1,000 homes. This is an important Realtor interview question. Realtor Interview Question #2: What is Your List-Price-to-Sales-Price Ratio? Knowing the agent's average ratio speaks volumes. Excluding sizzling seller's markets, a good buyer's agent should be able to negotiate a sales price that is lower than list price for buyers. A competent listing agent should hold a track record for negotiating sales prices that are very close to list prices. The Utah County Real Estate market has been fluctuating over the past few years. Ask Paul what his current list price to sale price ratio current is. Realtor Interview Question #3: What is Your Best Marketing Plan? This is a great question! Please carefully compare Team Teasdale's marketing plan to anyone. You will find we provide more internet marketing than any Utah County real estate brokerage. We spend alot of time and effort on selling each home we list. In fact, we get our clients more money and better terms. We are very dedicated to our clients needs. Feel free to review our Utah County Real Estate Marketing Plan. Realtor Interview Question #4: Will You Provide References? After selling over 1,100 homes in Utah County Paul Teasdale has many awesome references. Here are a few . . . Amanda bought a home in Saratoga Springs and Wendy bought a home in Provo with Paul. Here you will see many more recent references about buying or selling a home with our team. More references about these Utah County Realtors. See our Zillow Reviews and our Google+ Reviews. If selling, ask the Utah County Real Estate agent how he or she would market your home in Utah County. Understand that some agents may prefer to first tour your property and then put together a comprehensive customized marketing plan to present at a later meeting. But if he or she can't suggest a single strategy when asked, you might consider interviewing other candidates. Ask the Utah County Real Estate agent how often you should expect to hear from him or her. Know how and when you will communicate to avoid unrealistic expectations. Pay attention to office hours and whether you'll be invited to stay in touch via a cell phone or e-mail. Ask about designations. Interest in continuing education is a strong indicator of motivation and professionalism. Paul Teasdale has four designations check out his Real Estate Resume. Pay attention to the agent's listening skills. Does he or she cut you off before you've finished a sentence? There's nothing worse than looking at houses you have no interest in because the real estate agent has not listened carefully to your needs, or having your home on the market too long because it's priced incorrectly and the wrong buyers are being targeted. Ask the Utah County Real Estate agent what his or her fee structure is. Does he or she require a percentage of the sales price or work for a flat fee? Will the agent be paid another way? If you are unsatisfied with a prospect's plans or personality, thank him or her for taking the time to meet with you and repeat the process with another Utah Real Estate Agent. It can be time-consuming, but it's worthwhile. Once you've found the right Utah County Real Estate agent to represent you, hold up your end of the relationship and hire that Realtor. Be sure to ask many Realtor interview questions when you are considering hiring a Realtor.